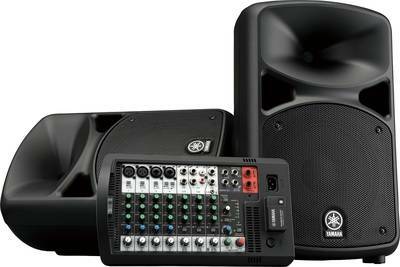 When it comes to portable live sound solutions, it doesn`t get any better than STAGEPAS. With impressive power and sound quality, intuitive control, and a comprehensive array of flexible features, including a new Bluetooth® wireless audio streaming function, this all-in-one PA system builds on the STAGEPAS legacy of providing everything you need to transform any environment into your own personal stage. One knob gives you access to four different high-quality reverb settings, perfect for vocals and acoustic instruments. Simply turn the knob to change the reverb type and time, and then you`re ready to apply just the right amount of high-resolution effect to each channel. This new function gives you instant mastery of your mix, allowing you to match your sound to your surroundings. Simply turn the knob to optimize the EQ for speaking engagements, musical performances, or just to kick in more bass, getting your sound right has never been so easy. Assign detailed EQ settings to each channel for precise management of your final sound. Great sounding 2-band EQ on the STAGEPAS 400BT and more flexible 3-band EQ on the 600BT make setup easy and precise. Vocal and guitar performances especially will benefit from newly added mid-range control on 600BT. Connect condenser microphones directly to STAGEPAS to get the best sound quality possible. Phantom power also means you won`t have to worry about DI boxes losing their charge during a performance. Expand your front-of-house system or set up a monitoring system by using the STAGEPAS together with other powered speakers such as Yamaha`s DBR, DXR and DSR powered speaker lines. STAGEPAS utilizes digital signal processing (DSP) to consistently produce high-quality, distortionfree sound at any volume level, whether you`re giving a business presentation or cutting loose in a club. What`s more, Yamaha`s intelligent DSP incorporates the use of advanced limiter circuits to protect vital STAGEPAS components, ensuring that you get the most out of your gear for years to come.